the Cape of Good Hope 喜望峰. We enjoyed rounding the cape. Borrowed from Middle French cap, from Occitan cap, from Latin caput (“head”). (geography) A piece or point of land, extending beyond the adjacent coast into a sea or lake; a promontory; a headland. From French cape, from Old Occitan capa, from Late Latin cappa (“cape”). The second sense s metonymic from the fact that many superheroes wear capes. A young woman in a crocheted cape. A sleeveless garment or part of a garment, hanging from the neck over the back, arms, and shoulders. Mind you, clothes were clothes in those days. […] Frills, ruffles, flounces, lace, complicated seams and gores: not only did they sweep the ground and have to be held up in one hand elegantly as you walked along, but they had little capes or coats or feather boas. To incite or attract (a bull) to charge a certain direction, by waving a cape. “I became a novillero when I was fourteen, but I had already been going to the fields and caping bulls since I was about twelve." (nautical) To head or point; to keep a course. 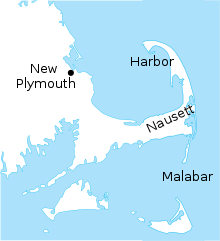 The ship capes southwest by south. To skin an animal, particularly a deer. (まれに) To wear a cape. Calamity tells me about the adventures she's had caping around the city, and I tell her about how I transitioned. When I tell her about David, and how he suddenly became a jerk overnight, she surprises me by nodding along. From Middle English capen (“to stare, gape, look for, seek”), from 古期英語 capian (“to look”), from Proto-Germanic *kapjaną. Cognate with German gaffen (“to stare at curiously, rubberneck”), Low German gapen (“to stare”). Related to keep. (obsolete) To look for, search after. Long may they search ere that they find that they after cape. (まれに, dialectal or obsolete) To gaze or stare. The captain just caped mindlessly into the distance as his ship was hit by volley after volley. This Nicholas ever caped upward into the air.